Imprint Method: 1 Color 1 Location - These classic Jars are perfectly suited to display your company's logo or message on the desk of your best customers. 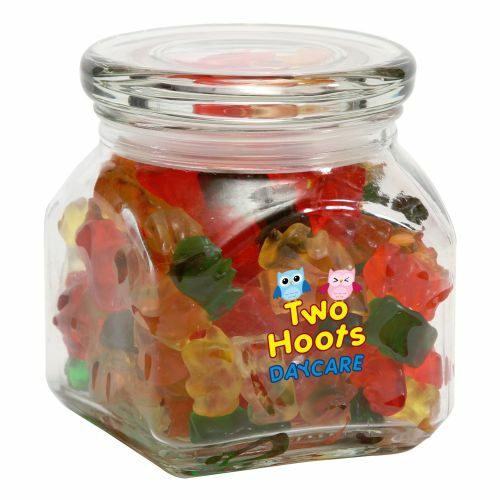 Filled with Gummy Bears, this promotional treat is a perfect gift during holidays, company anniversaries, or as a Thank You for business. Measuring 3 1/2 w x 3 1/2 d x 3 1/4, reward employees & clients with an imprinted and candy-filled delight. Make this a sweet deal and order yours today!When warm weather conditions apply, some perishable items require special packaging. Transit time for these conditions must be 2 days or less. Please contact Customer Service for details and an applicable freight quote.Our warm weather packaging consists of: Foil insulated sheets in corrugated box with cold packs for $14.99 (transit time must be 2 days or less). Size: 3.75 " x 3.5 " x 3.5 "